I know, I know... I'm always posting about brunch. But really, not much out there can beat an early morning weekend meal filled with some protein, and a ton of carbs. For the second Saturday in a row, I ended up at St Marks for brunch. At first we were going to go to Cafe Orlin (yes, again), but when we were told there was a 15 minute wait, we decided to walk another avenue over to Cafe Mogador to see how long the wait was there. It ended up also being 15 minutes, but since the menus are quite similar (American and Middle Eastern options), we opted to stay put. We were seated on the patio which was great for enjoying the weather and people-watching. Halumi Eggs, $10: poached eggs with roasted tomato, halumi cheese, olives, salad, and zahatar pita. I love halumi cheese, and this one was fantastic. It was served very warm and had that great salty and slightly nutty flavor and chewy texture to it. 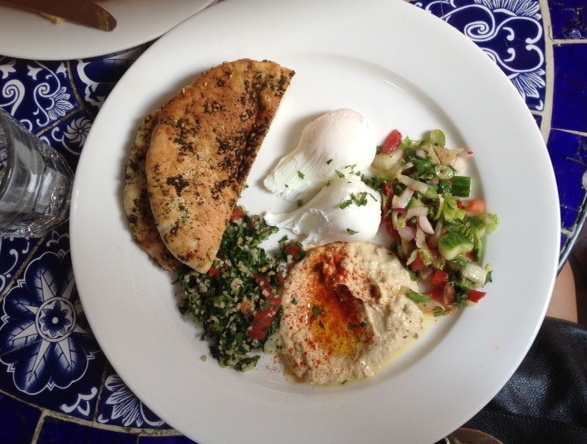 Middle Eastern Eggs, $10: two eggs any style (I chose poached) with hummus, tabouli, salad, and zahatar pita. It took me a while to decide between the Halumi Eggs and this dish, but the hummus that came with the Middle Eastern Eggs won me over, as I'm a huge fan of hummus. At this very moment I have 3 containers of Trader Joe's hummus's in the fridge. Original, Mediterranean, and Roasted Red Pepper. (Mediterranean is winning). Anyway, the hummus and pita were terrific! I liked that the pita was on the thick side. The hummus was very flavorful. I really liked the pattern on the tables, so I took this picture. The blue and white reminds me of Asian china. Prices on the menu are not up to date. The brunch specials are $14, not $13, and the two dishes we ordered were $10, not $9. Based on this, I'm assuming that many/all of the items are $1 more than the online menu prices. haha "mediterranean is winning". Hummus is taking over our fridge!!! !